The Story: Let other folks have their matzo balls and macaroons. The Passover dish I look forward to most is haroset. My family’s version is elemental: coarsely chopped Granny Smith apples, raw walnuts, freshly grated cinnamon and nutmeg. A generous pour of Manischewitz dyes the mixture a muted purple-brown color. It’s ugly and delicious. Early Friday morning I hauled out the food processor to make my annual haroset. As I peeled and grated, my stomach growled, making me wonder if I could apply the earthy flavors of haroset to steel-cut oats. Curious and hungry, I started a pot of McCann’s. By the time I’d packed up the haroset to take to a friend’s that evening, the oats were nearly done. I stirred in the spices and two cubed Granny Smiths and stopped myself just before I added a splash of Manischewitz. I wanted to replicate that astringent flavor, but Manischewitz before 7 am seemed jarring. Instead I used sweet balsamic vinegar that I usually reserve for fennel or other bitter salads. 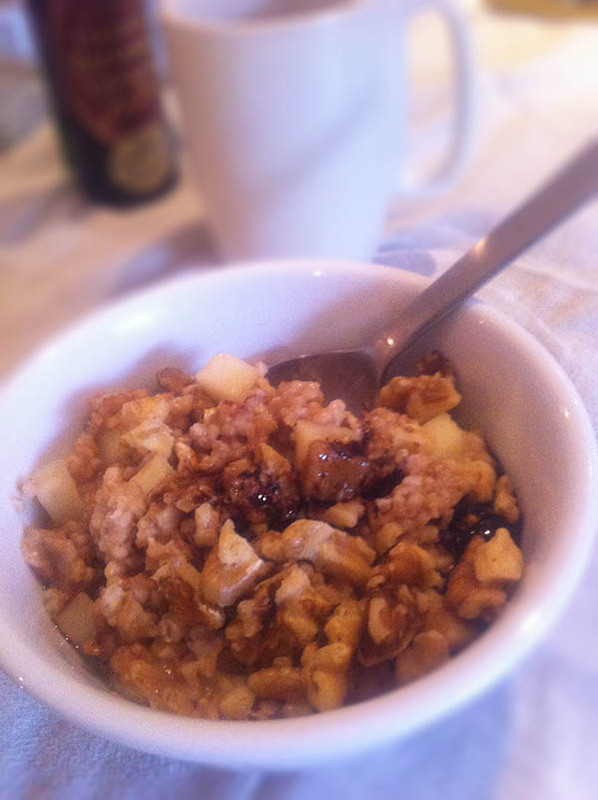 So as not to ruin the whole batch with my balsamic experiment, I scooped oats into a bowl and drizzled on the vinegar. After my first spoonful, I almost dumped out the bowl and started over. But once I mixed the vinegar into the oats with a handful of walnuts, the bland oats tempered the vinegar’s acidity. The mix didn’t precisely replicate haroset’s bitter earthiness, but it did remind me that the day, a holiday, was different from others, and not just because I had more to do. Those who are less nostalgic might like to add a dash of honey to balance out the vinegar. The Workout: I took my little one to the park, picked up macaroons and Passover cupcakes across town, took myself to the gym, and attended Shabbat at my son’s preschool—before 12:30 pm. The Instructions: Follow the directions on the McCann’s steel-cut oats can: “Into four cups of briskly boiling water sprinkle one cup of oatmeal, stirring well. When the porridge is smooth and beginning to thicken, reduce heat and simmer uncovered for 30 minutes, stirring occasionally.” When the oats are cooked, stir in 2 roughly chopped Granny Smith apples, ½ teaspoon cinnamon, and ½ teaspoon nutmeg. Top individual servings with a handful of roughly chopped (or just broken) raw walnuts and a tiny splash of good quality balsamic vinegar. Stir, taste, and sweeten with honey, if you like.